Today is my birthday. I'm 46. Which means there are likely more years behind me than in front--an interesting place to be. 1. You are special. Just as you are. Don't buy the marketing hype designed to make you feel less so you will buy things. 2. Enjoy the things you are good at and let the rest be. You don't have to be the "cookie mom" unless God wired you to do that. People's expectations (and often even your own) will always exceed your capacity. 3. Find out who you are. Try things. Don't give so much of yourself away that there is nothing left. (See #2). 4. The simplest path is usually the right path. If you are trying to do something and it keeps getting inordinately complex, stop. You will waste your energies. Chances are you are trying to make something happen that isn't supposed to or you are going about it the wrong way. 5. Forgiveness isn't just important; it is the only thing. Learn to give people grace. 6. There is beauty in setting aside your task list and just being. The world won't stop if you turn your thoughts off. Find some time for silence. It will recharge you and create space. 8. Have the courage to let go of things (and people) who are bad for you. 9. The clues to who you are lie in what gives you joy. Listen for that. 10. Back when I worked with Lifetime Guarantee, Dr. Bill Gillham frequently made a point by asking: "How did you forget your high school algebra?" The illustration goes that you didn't forget it by focusing all your energy on x2. You forgot your high school algebra by getting busy on other things. The idea is that it is easier to get rid of what you want to lose by focusing on what you want to gain. In the twenty plus years since I worked there, I've learned that the principle works for just about everything. Rather than focusing on eradicating the negative, it is way more useful to get busy with the positive. A very beautiful and insightful message. Thank you for giving on a day you should be receiving. Oh yeah, HAPPY BIRTHDAY!!! 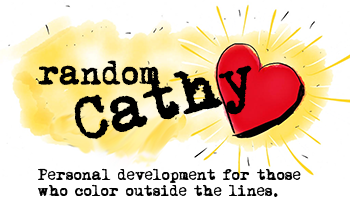 Cathy- Beautiful post! What a wonderful way to celebrate your birthday. Happy (belated) Birthday!! May your wisdom continue to shine upon all the women you continue to mentor through your blog. We women do need reminders like that, no matter what age. But especially the young ones, because the media seems to focus intensely on the young women, feeding them self-doubt and fear. Great job Cathy! Rock on :) with your uplifting and most purposeful post!